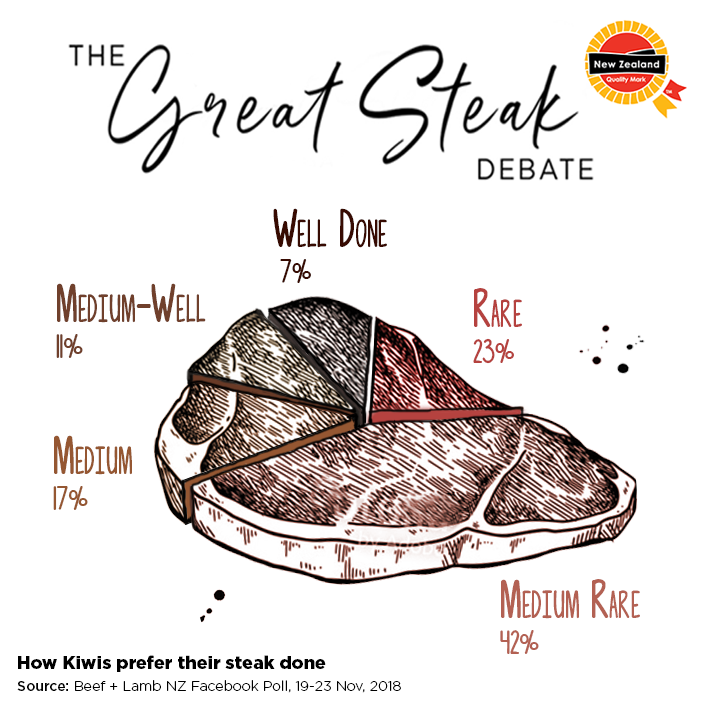 The result came off the back of The Great Steak Debate poll run on the Beef + Lamb Facebook page – fans were asked how they liked their steaks cooked with the choice of; rare, medium-rare, medium, medium-well and well-done. Of the 1,500+ respondents, at the time of writing the results were as follows; 626 (42%) voted for medium-rare, 342 (23%) chose rare, 254 (17%) opted for medium, 168 (11%) voted for medium-well and 106 (7%) decided against their better judgement that ‘well-done’ was their preferred steak scenario. The Great Steak Debate is one that has been discussed around the Kiwi dinner table for time immemorial. It’s often a polarising topic that can create rifts between friends and family, with the insult ‘you’re ruining a bloody good piece of meat there, mate’ frequently hurled across the grill.